The youth wing of the Jana Andolan Party today held demonstrations in Calcutta to protest the construction of a tourist lodge at Tiger Hill in a clear message that the hill party would no longer play second fiddle to Trinamul in the hills. 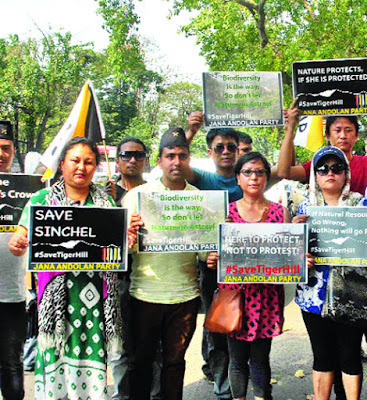 The JAP headed by Harka Bahadur Chhetri and other hill parties have opposed the constructions at Tiger Hill in Senchel Wildlife Sanctuary, alleging that the work is being carried out without proper environmental clearances. A 21-member group of the JAP’s Yuwai Ekai demonstrated in front of Nabanna and the new secretariat building of the tourism department in Calcutta but the protest had to be cut short after police intervened. The JAP members then held the protests at Park Street and Chowringhee. Basnet said they had shifted the demonstration to Chowringhee and Park Street to spread awareness among the ordinary people of Calcutta of “the unwanted constructions” at Tiger Hill in Darjeeling district. The protest in Calcutta is seen as a clear message by the JAP that it won’t go along with Trinamul in the hills any more. In the last Assembly elections, the JAP had joined hands with Trinamul and the GNLF. Today, Harka Bahadur Chhetri also said that the JAP would contest the coming municipal polls alone.